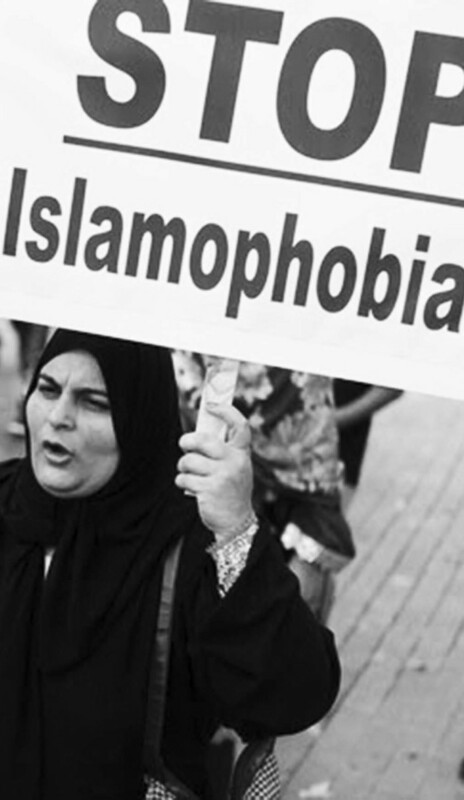 Muslims nationwide are standing up against Islamophobia. The toxic atmosphere of Islamophobia in the United States is saturating all communities and affecting the lives of every American. Incidents of violence and hatred are on the rise, ironically by self-proclaimed Christians/patriots and politicians greedy for power and fame. These forces, known and unknown, are working hard to bring about an apocalyptic clash between Muslims and the rest of the world. Physical attacks are becoming daily occurrences upon women, children, houses of worship – no one or nothing is exempt. Recently in New York City, a 6th grade girl was attacked by three 6th grade boys who put her in a headlock and punched her as they tried to take off her head covering. Also this month, joint efforts between the FBI, Philadelphia’s Human Relations Commission and the police were united in finding the owner of a red pickup truck believed to be responsible for the pig’s head left at the Al Aqsa Islamic Society – considered an act of abomination by Muslims. American authorities have in recent years been assuring Americans that they guarantee our national security and safety. Yet, incidents are on the rise and curious enough – the targets are Muslims and the culprits are so-called Muslims. Is there a conspiracy to cause anarchy? We Americans want to know. Many politicians in this country, especially republicans, capitalize on events as ‘Islamophobic opportunists’, creating grandstanding and fearmongering. Republican presidential candidate Donald Trump has been the most outspoken and vulgar in this regard. Trump, who had previously called for surveillance against mosques and said he was open to establishing a database for all Muslims living in the U.S., made his latest controversial call in a news release in the wake of the deadly mass shooting in San Bernardino and the day after President Barack Obama asked the country not to “turn against one another” out of fear. “Without looking at the various polling data, it is obvious to anybody the hatred is beyond comprehension. Where this hatred comes from and why we will have to determine,” said Trump’s release. “Until we are able to determine and understand this problem and the dangerous threat it poses, our country cannot be the victims of horrendous attacks by people that believe only in Jihad, and have no sense of reason or respect for human life.” Thus, Trump goes to the extreme, calling for a shutdown of Muslim immigration in the U.S. Trump’s ignorant rant about hatred negates the reality that hatred only creates hatred and never peace and harmony. And he is not alone. The Republican tide rides the same wave of odious and conflict-ridden rhetoric. God-fearing and peace loving citizens, especially Muslims with open eyes, have to be vigilant this coming election year. They have shown us that no Republican is deserving enough to represent us – particularly in the White House. Our President must declare to stand by the Constitution, which offers liberty and justice for all. The two front runners – both Carson and Trump – have shown that if elected President, the liberty they would profess to protect would not be afforded to Muslims, and therefore, both are already proven unfit to hold the highest office in our country. The escalation of hate crimes against and the harassment being experienced by American Muslims is being done to create conflict between Muslims and Christians. It is being promoted as a fight between Islam and the rest of the world. In fact, it is a war between good and evil. Those who believe in the Almighty Creator, irrespective of race, religion or culture, must become ambassadors of peace to help preserve our beautiful nation. We cannot allow orchestrated events, fear, hatred and ignorance to eradicate our way of life. America must remain the land of the free and home of the brave and American Muslims will continue to work to preserve this.